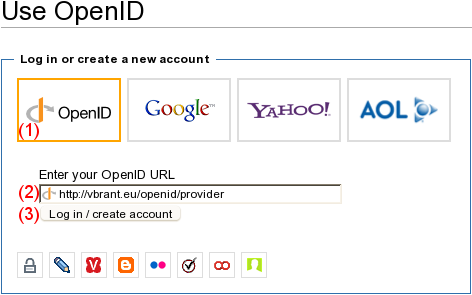 You can access the GBIF terms platform by means of your ViBRANT login (or any other OpenID provider). click on button “Log in / create account”. The following page is provided by the central ViBRANT server, enter your ViBRANT login name and password there. If you confirm, your login credentials (not your password) will then be passed on to the GBIF terms platform and you can work here. This page was last modified on 9 January 2013, at 12:11.